Bird watching tour in the fascinating landscapes of Eastern Mongolia. Morning arrival at Chinggis Khan Airport in Ulaanbaatar, transfer to the hotel, after breakfast short break, city tour including Gandan Monastery and the National Museum of Mongolia. After lunch we will visit the Choijin Lama Temple Museum in the city, dinner at the hotel. We start our trip to the east and drive to our ger camp at Bayangol. Bird watching at the lake Khukh Nuur. Continuation of our trip to Uglugch Wall, stay overnight at ger camp. We drive to birthplace of Chinggis Khan, Deluun Boldog in village Dadal. Stay overnight at ger camp. 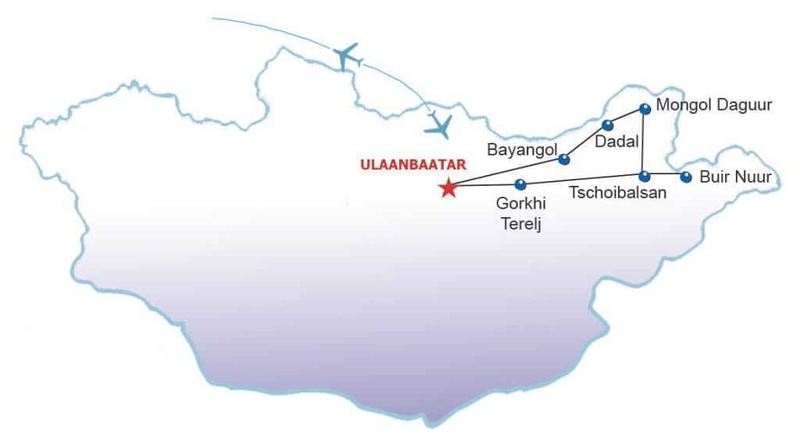 Today we drive to protected area Mongol Daguur (since 2007 UNESCO-biosphere reserve) along the river Ulz, on the way bird watching and stay overnight in tent the at village Dashbalbar. In the afternoon we will arrive in Mongol Daguur, bird watching and stay overnight in tent in protected area. We will drive in south direction and in the afternoon we will reach the lake Yakhi Nuur, bird watching and stay overnight in tent. In the morning we will drive to the provincial town Choibalsan and stay overnight in hotel. Drive to the lake Buir Nuur, bird watching at the lake, stay overnight in the tent. In the afternoon we will drive back to Choibalsan, stay overnight in hotel. In the morning we drive to another provincial town, Undur-Khan, stay overnight in hotel. Drive westward and late afternoon we reach our ger camp in national park Gorkhi Terelj. In the morning bird watching at the river Tuul, at midday drive back to Ulaanbaatar, in the evening farewell dinner with folklore.